Phlebotomists draw blood for tests, transfusions, donation or research, and may explain the procedure to patients, and assist in the recovery of patients with adverse reactions. According to the U.S. Bureau of Labor Statistics, phlebotomists earn an average median wage of $16.19 per hour, and job openings are expected to grow 25 percent between 2016 and 2026. Blinn’s Phlebotomy Technician Program provides students with a variety of blood collection methods using proper techniques and precautions. Students learn techniques for collecting with vacuum devices, syringes, capillary skin puncture, butterfly needles, and blood culture specimen collection on adults, children, and infants. The program emphasizes infection prevention, proper patient identification, proper specimen labeling, specimen handling, and quality assurance. The program consists of three courses, including 96 hours in the classroom and 116 hours in a clinical setting. 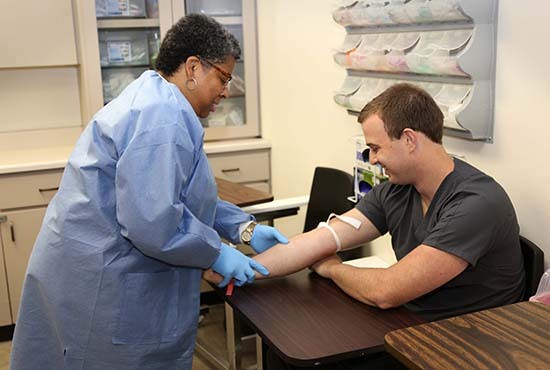 The classroom portion focuses on theoretical mastery of phlebotomy rules, regulations, and practices, and students must pass a skills test before Blinn arranges the clinical portion of their education. Upon successful completion of the program, Blinn provides a certificate of completion. Students are encouraged to further their credentials by applying for national certification through a recognized organization.